The Oak Island Light, which is famed as one of the newest and most unusual lighthouses on the East Coast, is easy to spot thanks to its towering location in the Caswell Beach community. Opened in 1958, this unique structure features a skinny exterior and three color blocks of light gray, medium gray and black, and is topped off with a four 2.5 million candlepower aerobeacon lenses that create quick bursts of light every ten seconds. Visitors are free to admire the structure at any time, and can even take a tour to the second floor in the summer months. Distinctive for its contemporary structure, the Oak Island Lighthouse is a truly iconic landmark along the Brunswick coastline. Nestled in between oak trees, native pines, and salt marshes thriving with wildlife, the Oak Island Nature Center is a great destination to discover the Brunswick Islands’ wild side. At the center, visitors can learn all about this diverse local landscape through exhibits on area shorebirds, reptiles, butterflies, and the local ecosystems that call the Brunswick Islands home. A number of programs for visitors of all ages are offered throughout the summer for a deeper education, and visitors will want to linger on the grounds of the center which features picnic areas, nature trails, and a stunning fishing pier and observation area on the edge of the water. Beautiful inside and out, the Oak Island Nature Center is a gem of a destination for nature lovers everywhere. Serving as one of 10 pristine sites that make up the North Carolina Coastal Reserve & National Estuarine Research Reserve, Bird Island is a paradise for visitors who appreciate unspoiled beaches. This 1,200 acre site that’s located on the edge of the North Carolina state border features plenty of white sand beaches and high natural sand dunes to go around. Enjoy lazy beach days along the oceanfront, or have a wild adventure by exploring the salt marshes and tidal creeks via a kayak or stand-up paddle board. No matter how a visitor decides to explore Bird Island, they’ll be treated to endless natural scenery and beautiful waterfront terrain in every direction. The Brunswick Islands are known for exceptional fishing, and anglers will find three fishing piers along the oceanfront that are wide open for visitors. The Sunset Beach Fishing Pier, Oak Island Pier, and Holden Beach Pier can all accommodate both anglers and sightseers, and visitors are free to enjoy hours of beautiful views and fantastic catches for a small daily fee. In addition, the three piers all boast on-site bait, tackle and gift shops, while the Sunset Beach Pier and Ocean Isle Pier also feature on-site grills for a delicious hot breakfast or lunch in between casting. With plenty of elbow room for reeling in catch after catch, and front row seats to beautiful sunrises over the ocean, the Brunswick Island piers are stunning attractions in more ways than one. The universe is waiting to be uncovered at the Ingram Planetarium, which is one of the more unique landmarks along the Brunswick Islands. Located in the heart of Sunset Beach, the Ingram Planetarium features an 85-seat SciDome Sky Theater, state-of-the-art high definition digital projection, and surround sound systems which make every show a fully immersive experience. Throughout the summertime, visitors can catch a wide array of shows including educational explorations of the skies above, purely fun laser and music shows, and just about everything in between. With an adjacent Paul Dennis Science Hall that’s filled with interesting exhibits, as well as an on-site Galaxy Gift Shop with space themed goodies, the Ingram Planetarium offers hours of fun, and is a great rainy day destination on the Brunswick Islands. Regionally famed as North Carolina’s only natural history museum that’s located on a barrier island, the Museum of Coastal Carolina makes waves with adventurous visitors thanks to its array of fascinating and ever-changing exhibits. Visitors can learn about the area’s nesting sea turtles, dig through the fossil pit on the hunt for treasures, touch sea stars and other sea critters in the Touch Tank, admire vast collections of local seashells and massive shark jaws, and study intricate dioramas of the local landscapes. Covering all of the area’s unique features from the offshore ocean reefs to the inland Green Swamp reserve, this all-encompassing museum is a great way to discover the local landscapes in their entirety with a hands-on and truly entertaining experience. Situated on the eastern edge of Ocean Isle Beach, Ferry Landing Park is a popular destination for gorgeous sunsets and on-the-water explorations. 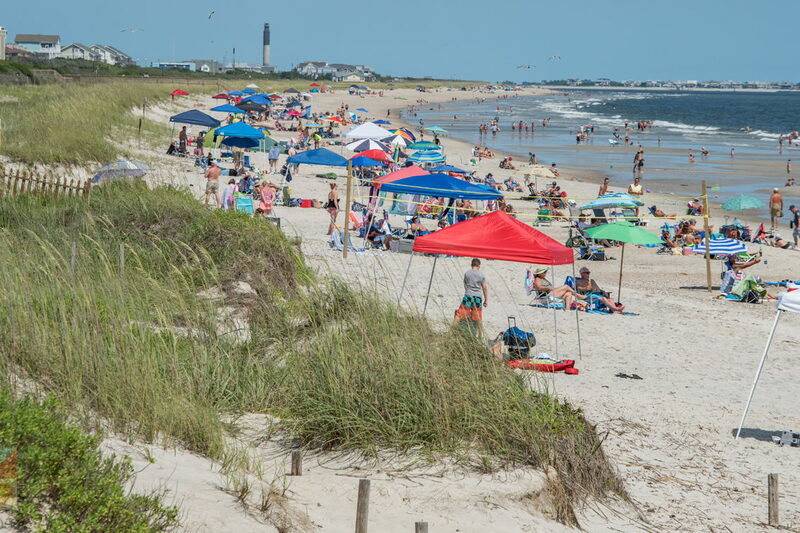 This popular public park is situated on the site of the original ferry crossing to Ocean Isle Beach, which was once the only way to access this barrier island community. Today, the site is a gem of a find for visitors, thanks to its waterfront gazebo, picnic tables, fishing pier, and stunning views of the Intracoastal Waterway. From birdwatching or catching a sunset, to setting off on a paddling trip through the calm waters, the great outdoors is easily explored at this favorite Ocean Isle Beach destination. When it comes to beautiful views, great fishing, and fantastic watersports, the Intracoastal Waterway is certainly a tempting destination that’s arguably just as popular as the miles of ocean-facing beaches. The Brunswick Islands offer multiple ways to explore this unique waterway as well, thanks to a number of boat tours and rentals, watersports shops, fishing charters, and other businesses that launch from the water’s edge. Enjoy a day of kayaking, stand-up paddle boarding, or jet skiing for an active adventure, or just head to one of the area’s many waterfront parks or restaurants to take in a brilliant nightly sunset. With multiple boat launches situated in coastal communities including Sunset Beach, Ocean Isle Beach, Holden Beach and Oak Island, enjoying the Brunswick Islands’ second favorite body of saltwater is always a breeze. From 1958 until 2011, the only way to access the town of Sunset Beach was via this classic swing bridge that connected this barrier island community with the rest of the mainland. Replaced by the more modern Mannon C. Gore Bridge, today this iconic bridge and tender house has a new home on dry land, where it serves as the relatively new Sunset Beach Swing Bridge & Museum. At this distinctive site, visitors can admire artifacts from the Blockade Runner Vesta which ran aground on the local shoreline during the Civil War, admire the historic bridge up-close and in person, and learn about the roots of this thriving vacation destination. A popular gathering place and museum, the Sunset Beach Swing Bridge & Museum is brimming with fascinating stories and plenty of down home charm. Learn all about the unique wildlife that call the local waters of the Brunswick Islands home at this popular destination where education is fun for visitors of all ages. The Ocean Education Center is located just a shell’s throw away from the shoreline in Oak Island, and is a popular spot for visitors who want to explore the local North Carolina waters in-depth. The center features a wealth of information on all things ocean related, which includes special programs that highlight the area’s sea turtles, sea shells, crabs, jellyfish, and even sharks. With a host of programs held over the summer months, which includes weekly turtle talks and even ‘touch tank” programs where visitors can meet and greet with sea creatures, there’s always something exciting to discover at Oak Island’s own Ocean Education Center. From the stunning landscapes of the Intracoastal Waterway, to the historic sites and landmarks that longtime visitors have come to know and love, the Brunswick Islands offer a world of attractions both on and off the beach. Spend a rainy day exploring the local museums, or plan an outing to the area’s wild parks and nature trails, and discover why the Brunswick Islands are so much more than just beautiful ocean shorelines.